A Collection of jQuery, Ajax and PHP Tutorials with live demos, tutorials posted on 9lessons blog. In these demos I had explained about jquery connectivity with MySQL database, Ajax implementation, JSON with PHP and Animation addons to your web pages. I hope it's useful for you. Thanks! Flash Effect Image Loading with Jquery. 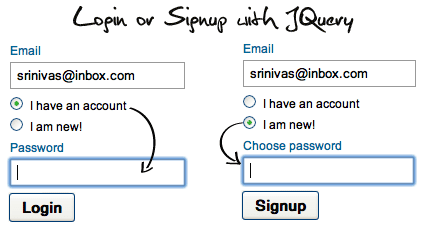 Create Bit.ly Short URLs Using Jquery and Ajax. the most functionally for web application ever..
Amazing, thank you very much, great work!!! Thank you a lot Your JSON tutorial did the job and made me understand the mechanics. I have problems with the menu item selection, the text still coming behind the release button in the Firefox browser (Internet Explorer working fine!) Any solution?